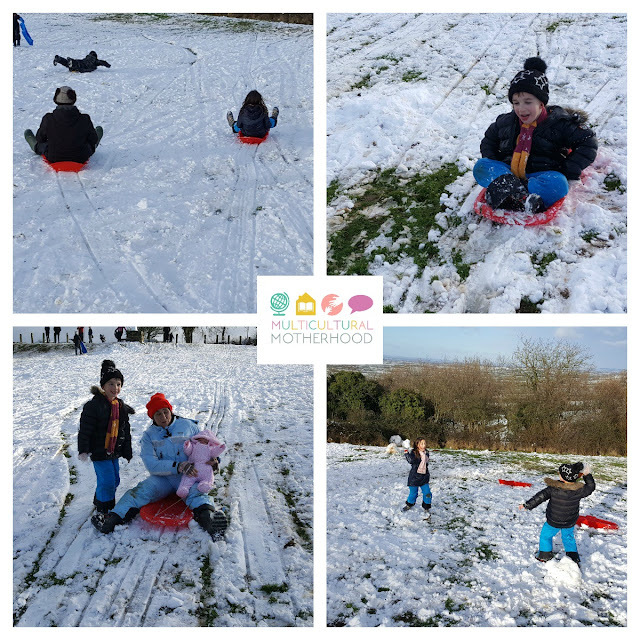 At the end of December we had some snowfall and went sledging which was a lot of fun! 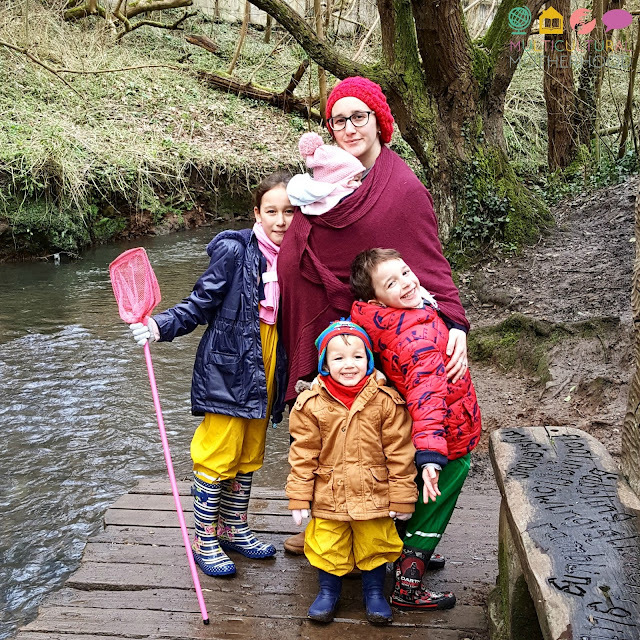 The month started off well but mid-January we found it hard to get outdoors as illness swept through the household. This month has been up and down but we have managed to get out to our nature spot a couple of times. We started our study of the winter sky a few days before January began as we had an unexpected scattering of snow. The children were so excited to see the ground covered in a carpet of white one day when they woke up. Without even waiting for breakfast, they were out in it and delightful sounds filled the air. We knew we did not have long to enjoy the snow as it normally melts pretty fast so, after breakfast, we decided to go up in the hills to make the most of it. The children wrapped up warm and had a lot of fun sledging. This was the first time K had ever been! I also embraced my inner child and went whizzing down the hill with the children. 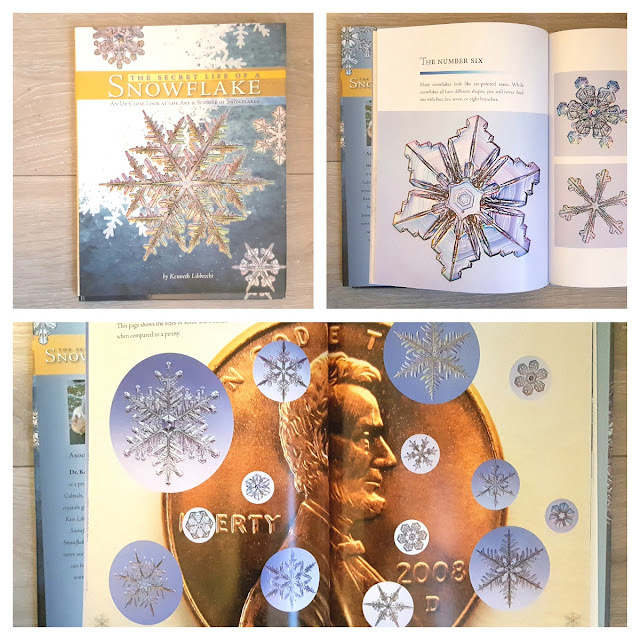 I bought this wonderful book 'The secret life of a snowflake' by Kenneth Libbrecht which has been a real delight to read. The book is written by a photographer and has a collection of photographs of real snowflakes as seen under a microscope. 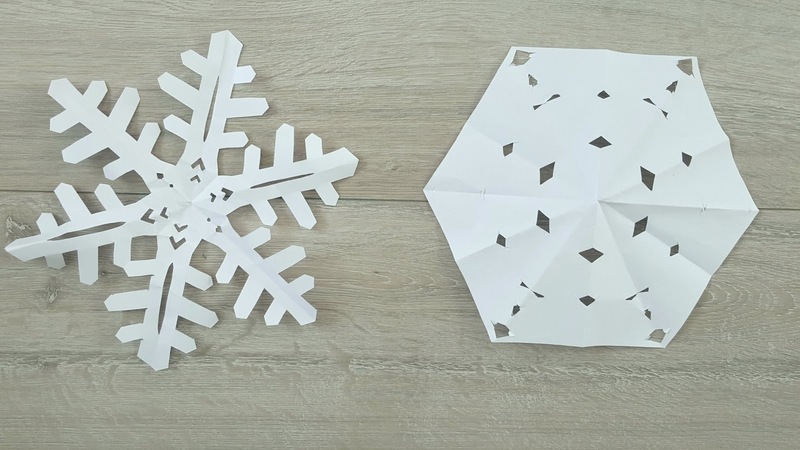 The beauty of each unique snowflake is awe inspiring. The book gives instructions on how to fold paper correctly to make paper snowflakes. The children had great fun making lots of snowflakes! 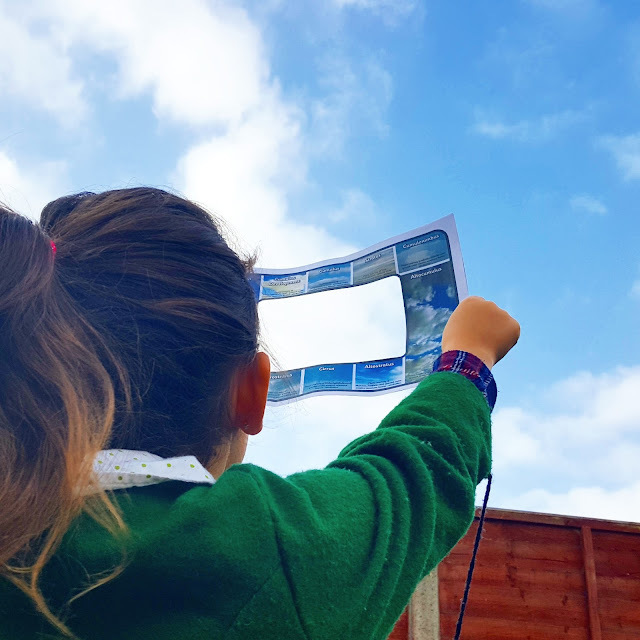 Then we took a look at different types of clouds we might observe during winter sky week. The children made posters and created the different types of clouds with cotton wool. 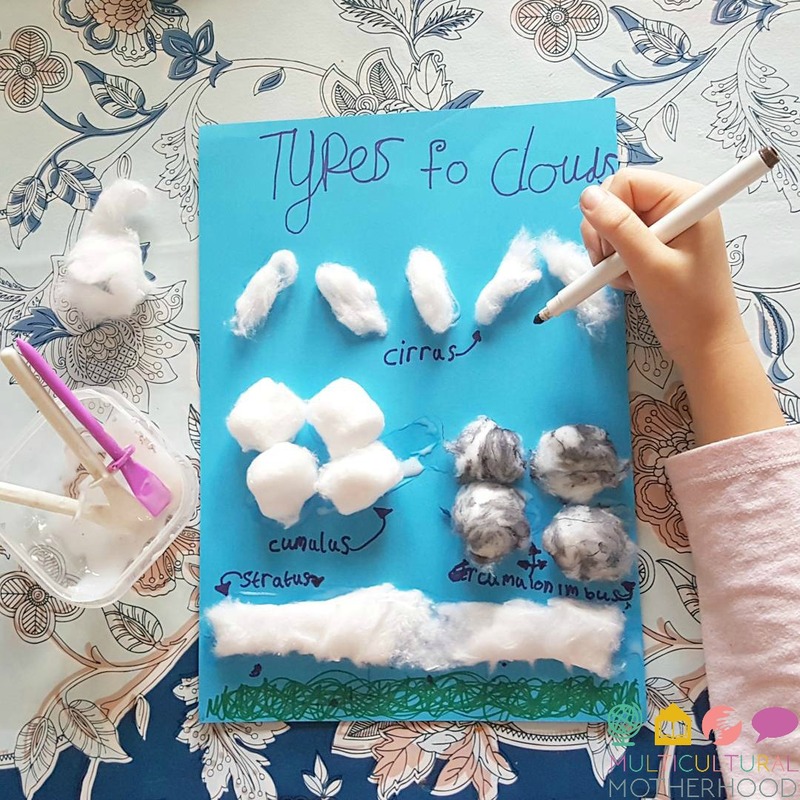 We used a cloud viewer from Twinkl to help us determine the types of clouds in the sky each day during winter sky week. The children used these sheets from the Exploring Nature With Children Guided Journal to record their observations. 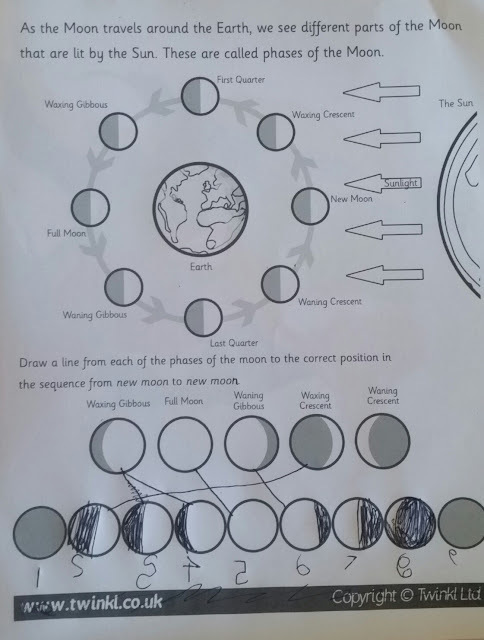 We had studied the moon in great detail last year during our astronomy topic. To learn how we did this in more detail, click here. Therefore, we did not spend too much time working on the moon. Instead we recapped our previous learning. 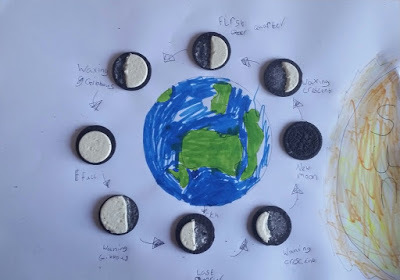 To learn about the phases of the moon, we used oreo cookies. The children had a lot of fun scraping the cream off the cookies to create the different phases of the moon. We all ended up eating lots of cookies during this activity! 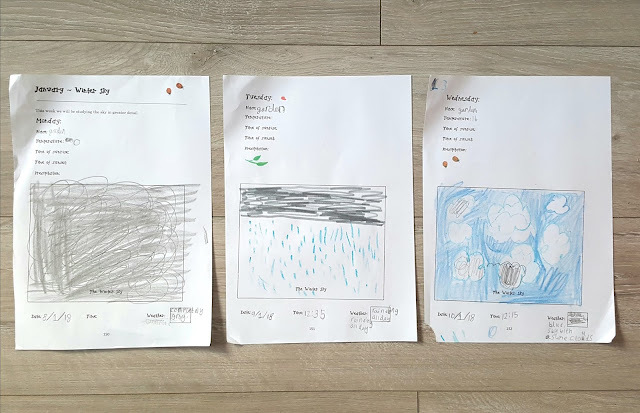 Next, the children completed these worksheets which can be downloaded from Twinkl. 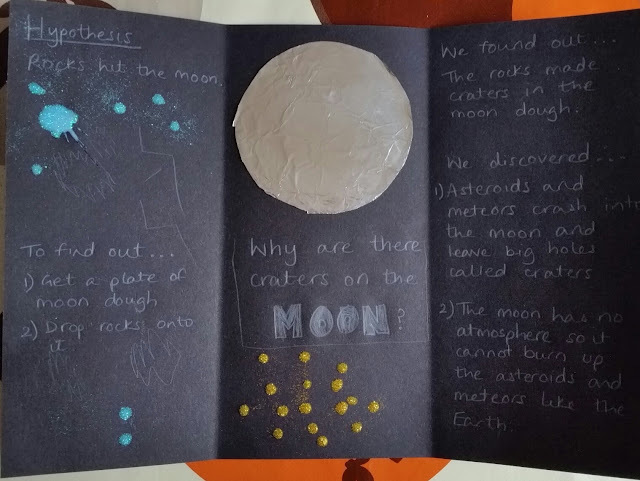 I wanted to explain to the children how there happens to be craters on the moon so we did an experiment to find out. Before doing the experiment I asked the children why they thought there were craters on the moon. To do the experiment I placed some cloud dough in a dish and collected some stones from the garden. Then I asked the children to drop the stones into the dish and see what happened. 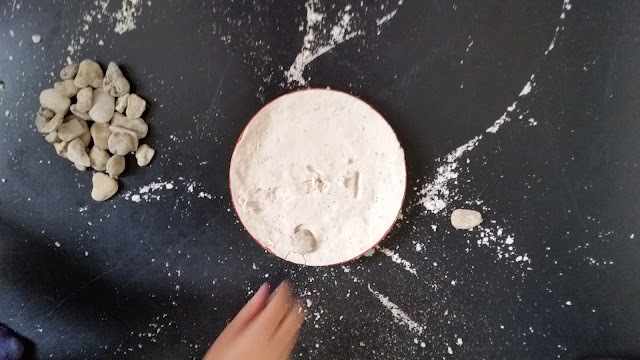 They discovered the stones made marks in the cloud dough where the stones had impacted and I explained craters were made on the moon in the same way. 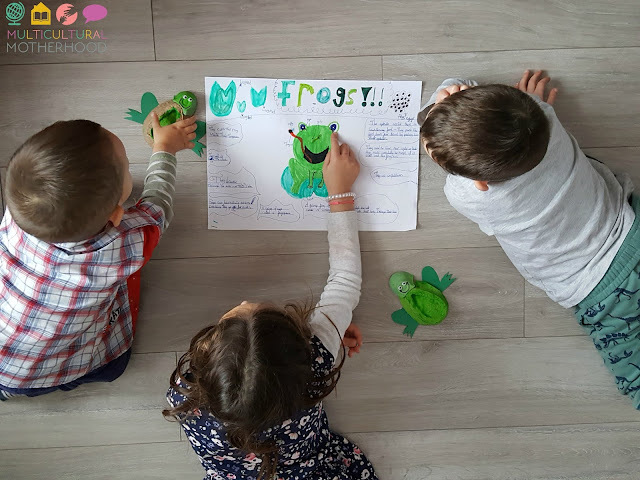 It is always good to do a practical activity to help children to understand certain concepts. We started off winter tree week by discussing the difference between evergreen trees and deciduous trees. 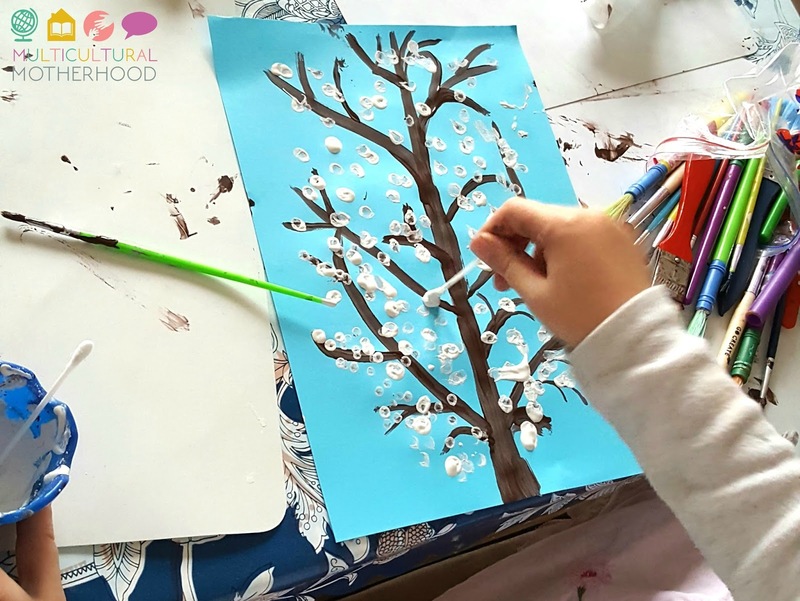 Evergreen trees keep their leaves in the winter whilst deciduous trees lose their leaves. 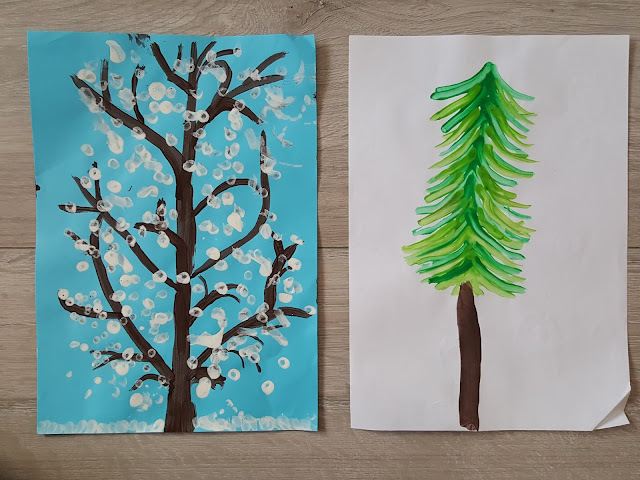 The children painted pictures of these two different types of trees using cotton buds. 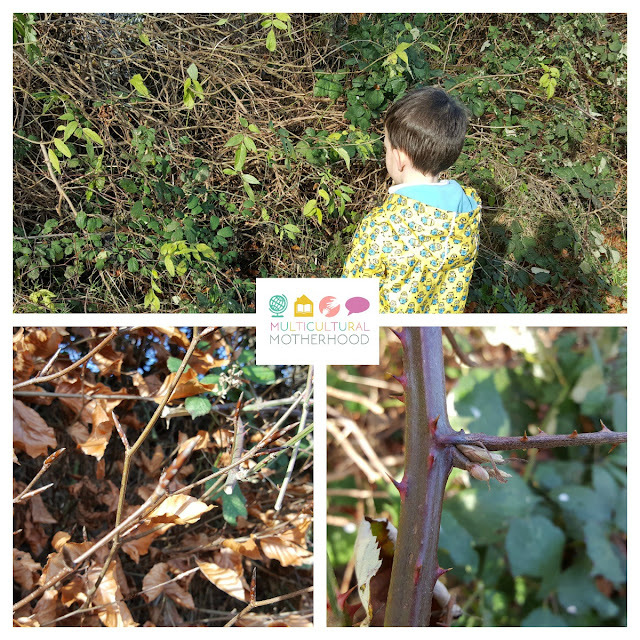 Then we went on a nature walk to find some new buds starting to grow on branches in our nature spot. 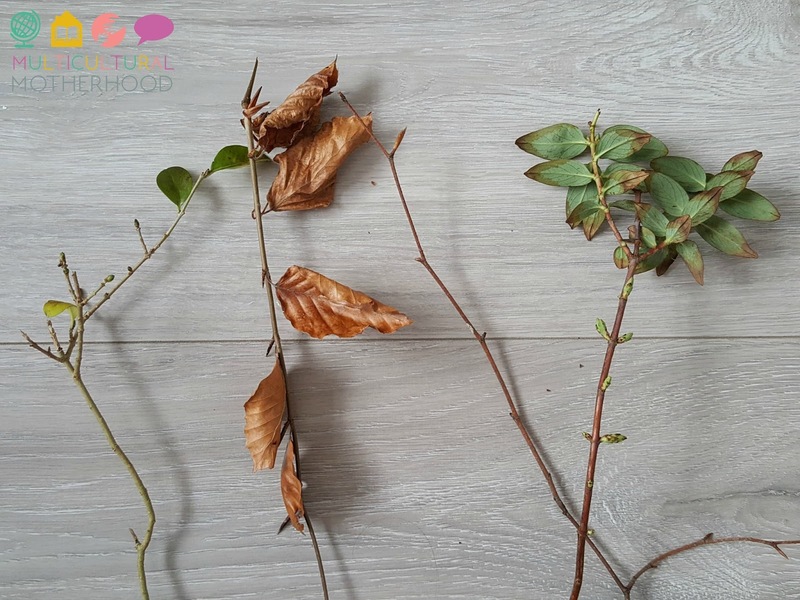 I collected a few different branches to take home and observe more closely. 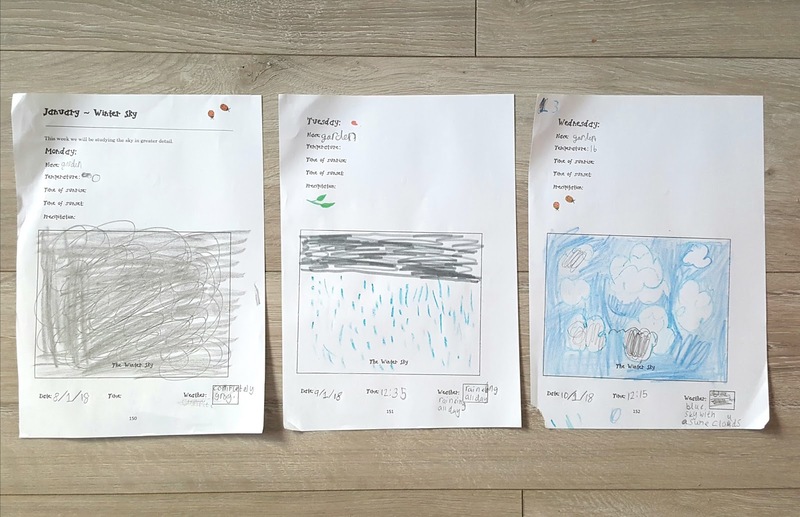 When we got home we looked at the buds and talked about the differences between them. We placed them in a jar of water but there are no signs of growth yet. 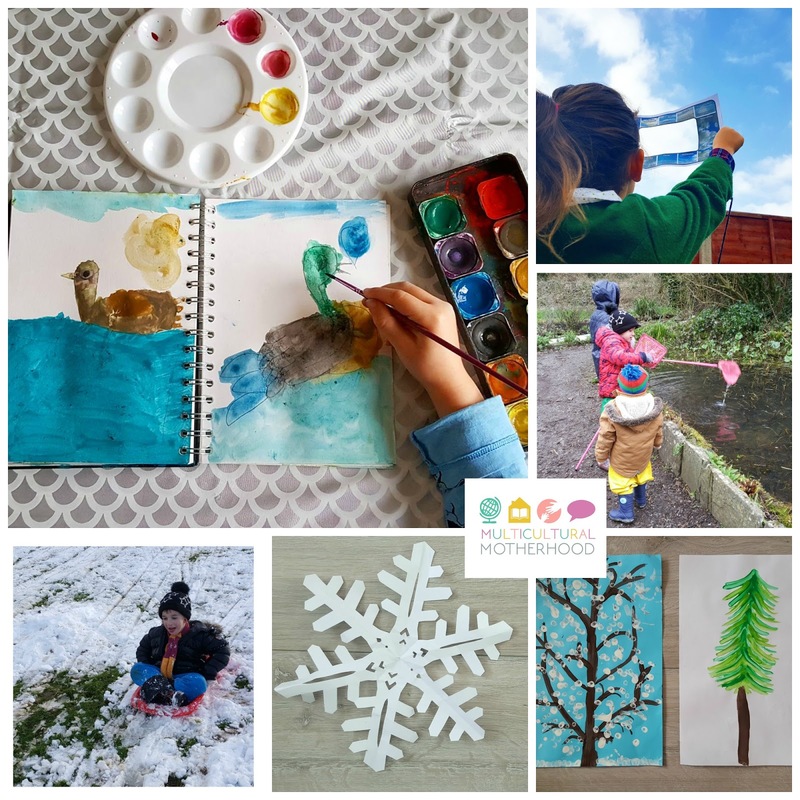 The final week of January was winter pond week. 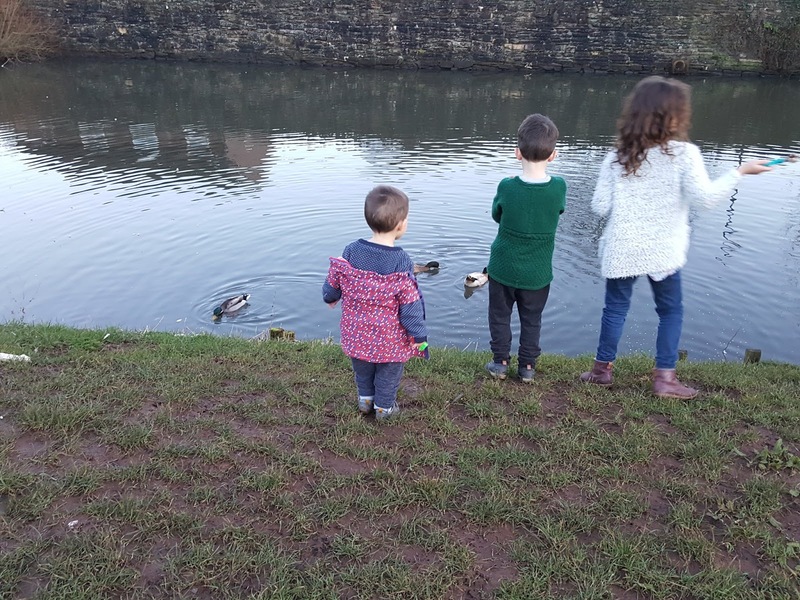 We went to a local duck pond to see if we could spot any ducks. I had recently found out that it was not a good idea to feed ducks bread so we took some oats and bird seed to feed them. Other things the ducks may like to eat are peas, sweetcorn and greens. 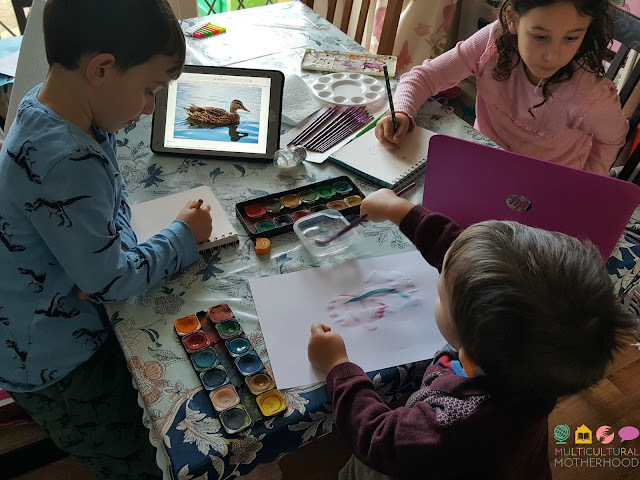 When we got home the children got to work painting some of the ducks they had seen. I mentioned during the autumn pond study week that I had never been to our usual tadpoling pond during autumn and I was amazed to see so many plants growing in and around the pond. I had also never been to the pond during winter so I was looking forward to returning and seeing how the pond had changed. We noticed that there was less greenery in the pond now as a lot of the plants were dead. 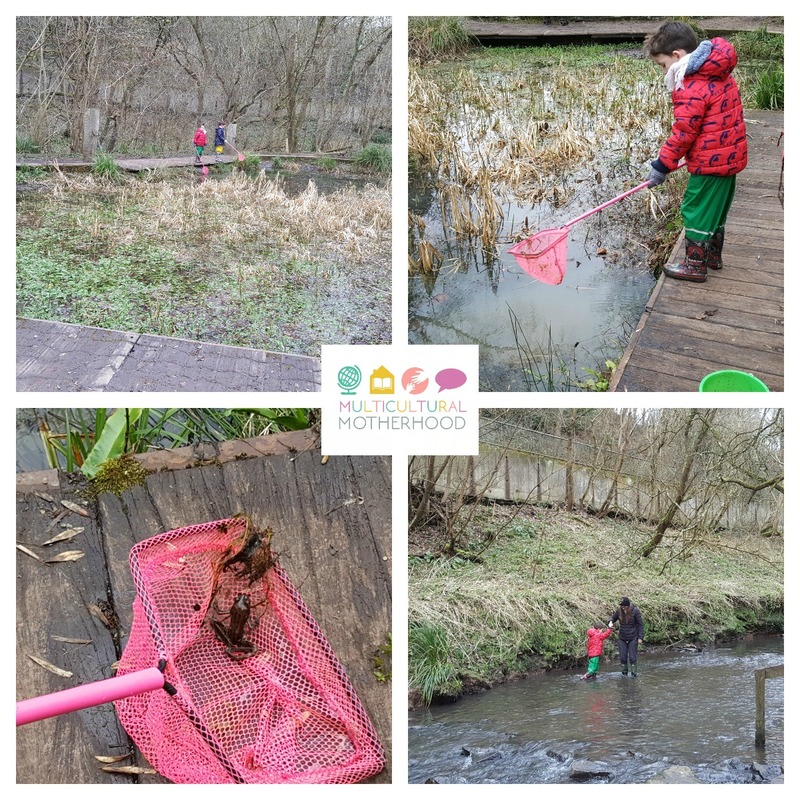 The children used there fishing nets to see if there were any creatures lurking in the pond. To our surprise, D caught a frog! It was the biggest frog we had ever seen! I was worried we had disturbed it from hibernation so we quickly put it back. After pond dipping, we went for a walk in the stream. After our encounter with the frog in the pond, I decided it would be interesting to learn about these amphibians. D got to work on making a poster all about frogs. 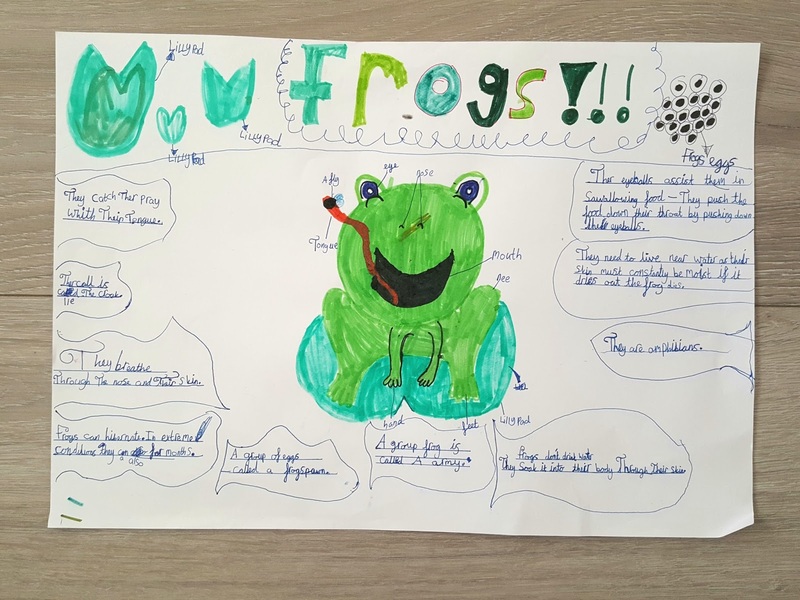 She drew a big frog in the centre and wrote interesting facts around it. While she was doing this, the boys made some frogs out of junk. 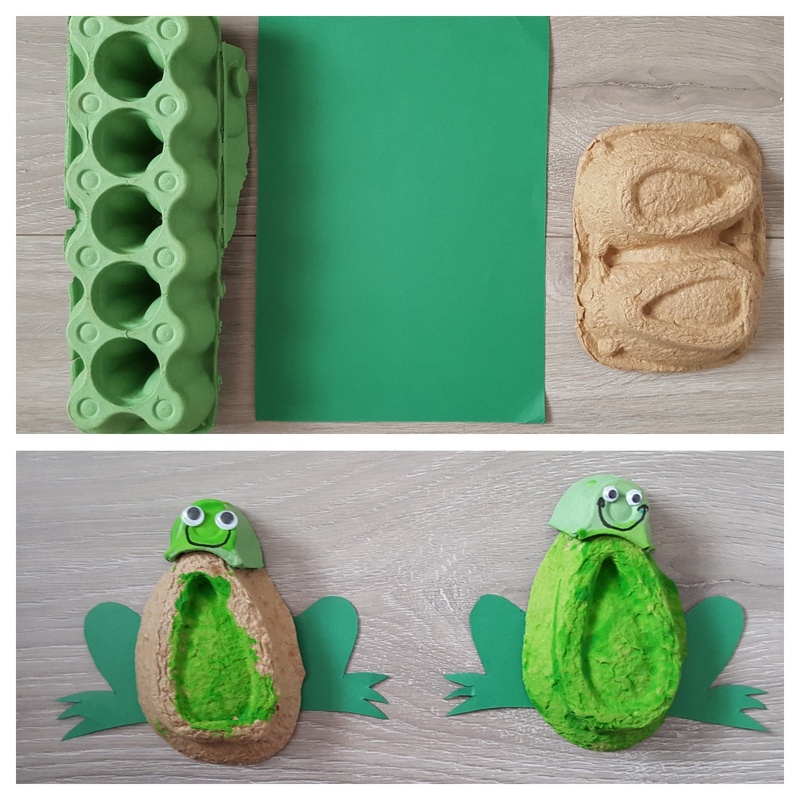 I rummaged through our junk drawer and found some packaging from a pack of avocados which I thought might be good as the body for the frog. I cut a bit of an egg box for the head and the boys stuck it onto the avocado packaging. Next, they painted the frogs green. 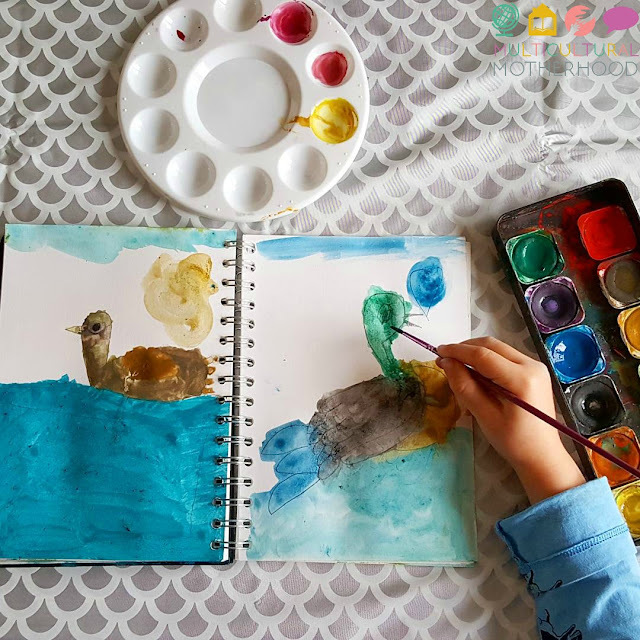 Once the paint had dried, the boys stuck googly eyes onto the heads of their creatures and cut out some legs from green card. The final touch was giving the frogs smiley faces. 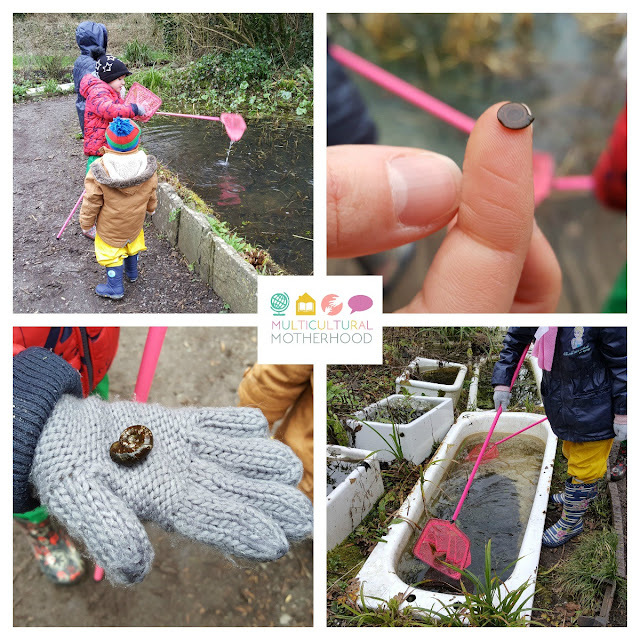 We have had a lot of fun with nature studies this month and have enjoyed spending more time outdoors. I am really looking forward to the topics we will be covering in February. 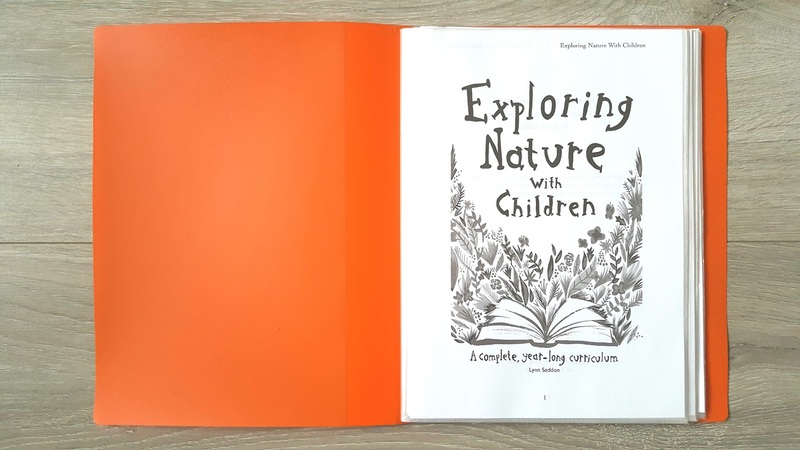 To take a look at the curriculum you can use the links below. Have you been following this curriculum? 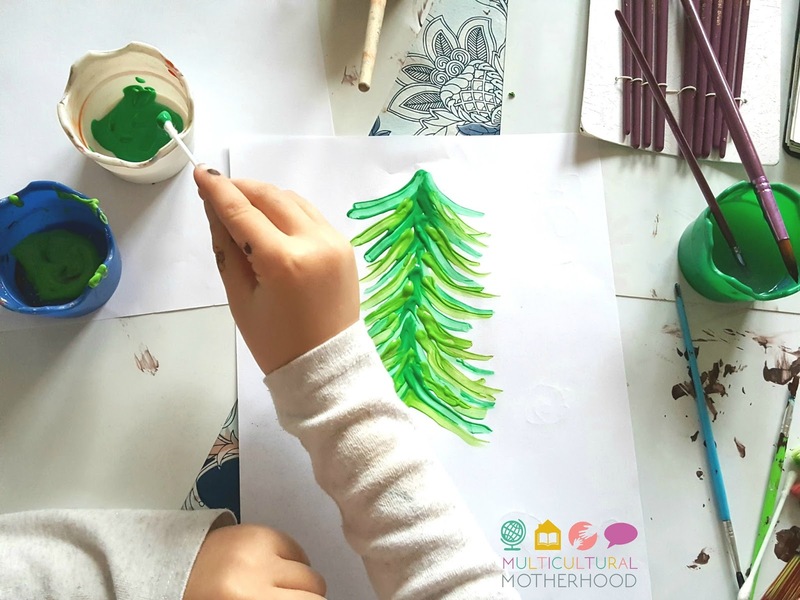 What activities did you do during January? Which Language Should I Speak to my Child?